Finished basements are one of the most popular renovation projects today and offer a great way to expand the living space in your home. Ideally the renovation will include a basement bathroom for comfort and convenience. 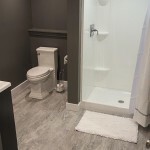 Adding a bathroom to your basement renovation requires some special considerations and planning to ensure your project is a success. Is Gravity On Your Side? If you’re designing a new home or about to break ground this is an excellent time to at least plan ahead for a future bathroom. 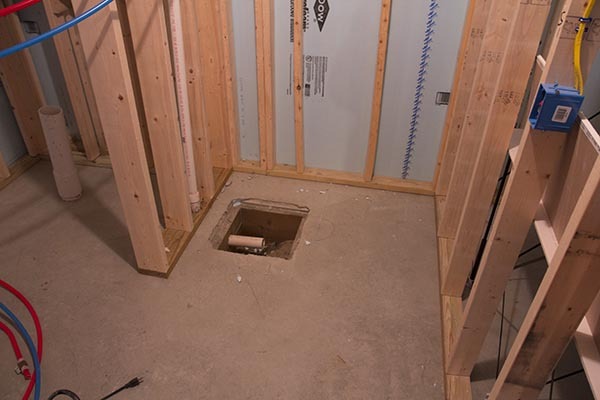 Plumbing drain lines for a basement bathroom are quite often the most challenging part of the project. Whether you live in an area with municipal sewer or in a rural area with a septic system, how the sewerage flows out of your home is a design detail that requires evaluation and planning. 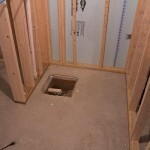 In new construction I suggest that all my clients either install drain lines under the slab connected to the sewer or septic system in a gravity feed configuration or at the very least install a sump chamber for a sewer pump if gravity isn’t an option. 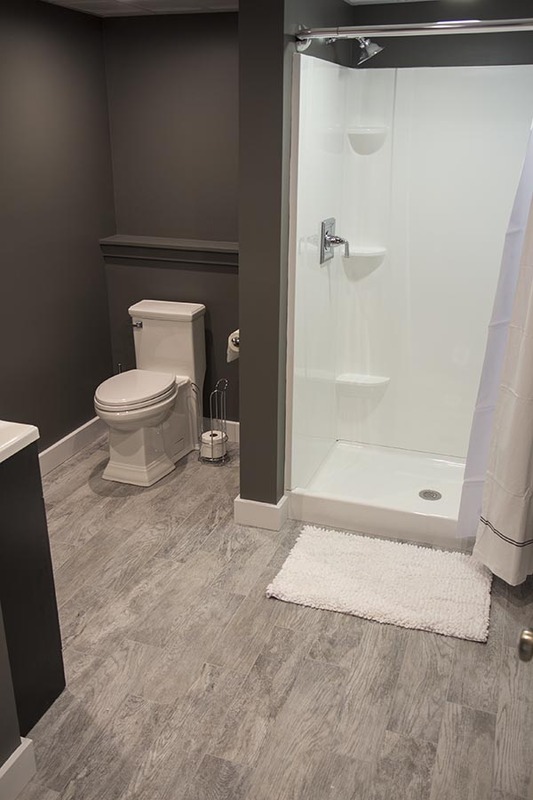 This is typically a low cost add to the construction cost that will save time and money in the future when a basement bathroom is wanted. For renovation work things get a bit more complicated. In fact, the location of the bathroom in the basement may be dictated to some degree by the required plumbing drain lines. If the sewer line for the home exits below the basement slab it’s quite possible that a gravity system can be utilized by cutting the slab, installing drain lines, and patching the slab. This is the best long term solution from a maintenance perspective. 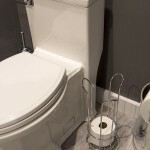 If the sewer line exits the house above the slab elevation the basement bathroom will require a sewer pump in order to pump the sewerage up and out of the home. 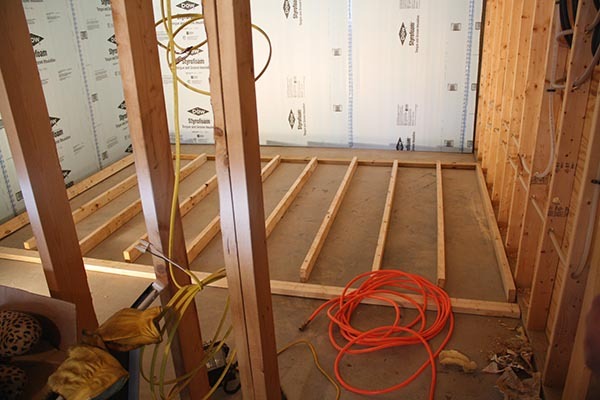 Insulation – Basements Are Different! Insulating a finished room in a basement is so much more complicated than bathrooms above grade. This is a topic I’m quite passionate about because it’s so often done incorrectly and the results can be extremely expensive and unhealthy. Over the years I’ve seen so many cases of mold in finished basements that I’ve lost track of the numbers. In almost every situation the problem could have been prevented by properly insulating the space. I’ve written numerous articles on how to insulate basements so I won’t go into great detail here. I’d rather point out insulation details that should NEVER be used in a basement. Then you can go read my other articles and learn how to do it correctly. Fiberglass insulation should NEVER be used in your basement as a primary source of insulation. A plastic vapor barrier against concrete followed by fiberglass insulation is NEVER a good solution. In order to properly insulate a foundation wall you’ll need some type of foam insulation (spray or board). This is extremely important especially in a basement bathroom where moisture will be attacking the room from two sides. Proper ventilation in a basement bathroom is even more important than in bathrooms above grade. Trapped moisture in a basement can lead to serious mold and mildew problems especially when most basements don’t typically have many windows or doors to provide natural ventilation. The Home Ventilating Institute recommends a minimum of 1 cfm per square foot of the bathroom size in order to achieve approximately 8 air changes per hour for the room size. In addition to properly sizing the bath exhaust fan I also recommend that you install a bath fan timer in order to ensure that the fan runs long enough to exhaust the room, and also to prevent running the fan longer than necessary. In most cases the fan can be easily ventilated by running flexible duct from the basement bathroom to the nearest rim joist and vented to the outside. 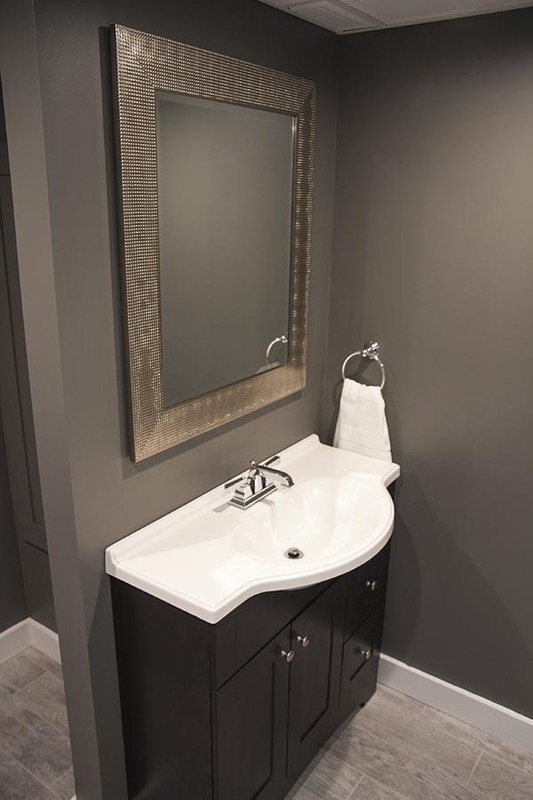 When it comes to selecting finishes for a basement bathroom the sky’s the limit as they say. Having said that I prefer to stick with tile for the flooring even though on upper floors it’s sometimes nice to use wood. 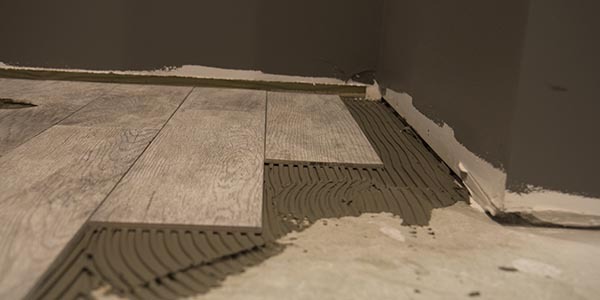 The great news is that the tile industry has some beautiful tile that simulates wood floors (something we just used on our new basement bathroom). It’s important to use good quality latex paints for the walls and the trim. For the ceilings I prefer some type of suspended system to allow future access to venting, electrical, and plumbing lines. 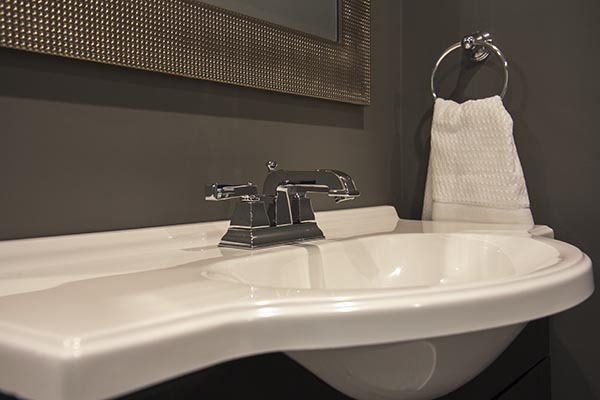 When it comes to plumbing fixtures there are endless choices. 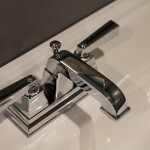 Over the last few years I’ve been impressed with the quality and selection of affordable plumbing fixtures. 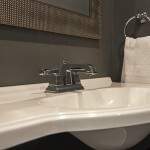 For this project we used fixtures from the American Standard Town Square® Collection. I’ve come to trust their products because of their quality, selection, and affordable pricing. In fact, I find their products to be of better quality then some of the high priced “designer” products that we’ve used in the past. 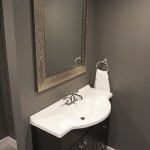 The biggest advice I can give anyone about a bathroom renovation or new construction is planning ahead. Make a wish list of features, fixtures, and finishes that you’d like in your new bathroom. Then make appointments to get bids from at least three reputable contractors. Most bathroom projects of this type are typically beyond the DIY level and will at least require a plumber and electrician. Ask family and friends for referrals and be sure you get written estimates. Adding a bathroom to your finished basement will certainly increase the value of your home and make the basement far more functional. Todd – Bathroom looks great. I’m doing a similar project and was wondering if you’ve had any condensation problems in spring when the floor is still cold? 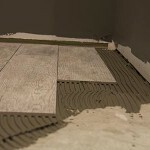 Do you have under slab insulation? In NJ we may get some early hot and humid days and I like to open the windows for fresh air. Unfortunately it has in the past caused condensation on the floor. I guess easy answer is to just keep the windows shut and run the AC or dehumidifier. I’m planning on adding some insulation and plywood as a subfloor but maybe’s it’s not necessary.. Would you have a recommendation? My slab is insulated because we have radiant heat. We also have a vapor barrier. The big thing is controlling humidity either with open windows or A/C. Have you measured the humidity levels? Thanks for replying Todd. Yeah, my winter humidity hovers around 50%. I can keep it around 50% in the summer by running a dehumidifier about 8 hours a day. This is an older house (built in 1954) with a 3″ slab on dirt, so no advantage of insulation or vapor barrier. 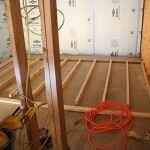 My plan is to lay down poly with 3/4″ 250psi EPS covered with 1/2 plywood. I’m trying to preserve as much ceiling height as possible, floor to joist is only 7’1″. I’m hoping that’s enough to keep the floor above the dew point. I’ll probably just need to be diligent in keeping the dehumidifier running and windows closed in the spring time.